This week I would like to draw your attention to a sight which, weather permitting, will grace the sky after dark on Sunday evening (January 13), when the moon and Mars form a pretty pairing, writes Ian Griffin. After sunset on Sunday, the moon will be high in the northwest. As the sky darkens, Mars will be visible as a bright distinctly red ''star''. 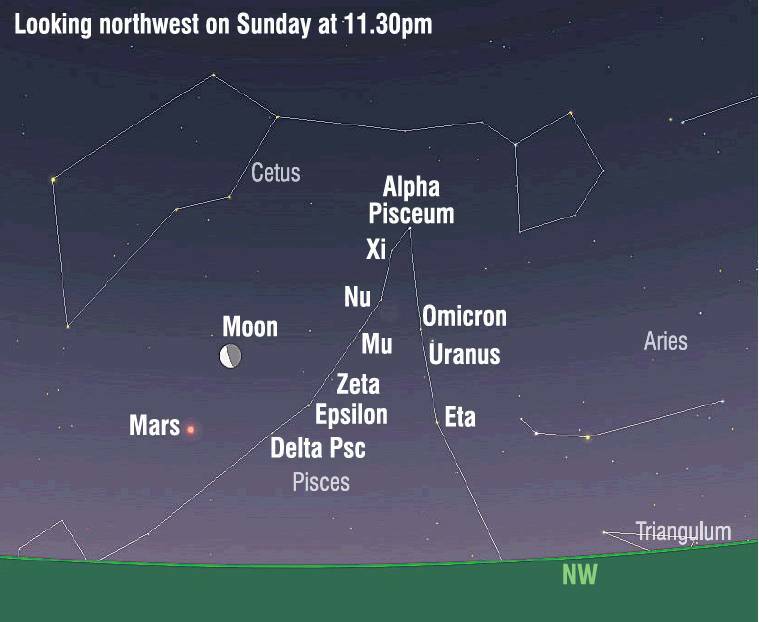 On Sunday, Mars will be just over six degrees below the moon. If you have been watching the red planet for the past few months, you will have noticed that it has dimmed significantly since it was closest to Earth last July. Mars has faded because its distance has dramatically increased. In July, the distance between Earth and Mars was approximately 58 million km, but now the distance has increased to more than 200 million km. If you are up for a little adventure, and have access to a pair of binoculars, you can use the trail of stars which form part of the constellation of Pisces, to track down the gas giant planet Uranus. This week's chart labels the naked-eye stars, which form this trail with Greek letters. Way back when the constellations were first drawn by ancient astronomers, they assigned Greek letters to the stars, with Alpha being the brightest followed by Beta, Gamma, Delta etc. The moon and Mars form a triangle with the yellow/orange-coloured star Delta Pisceum. Once you find Delta, follow the trail of stars upwards; one of the things I really like to do when scanning the sky like this, is to observe the different star colours. As you ascend the tail, you should see that other than the white colour of alpha, almost all of the stars appear yellow or orange, signifying that they are somewhat cooler than the sun. On Sunday night, Uranus (which appears a distinctly green colour) will be close to the star Omicron. Let me know if you find it!